I write poetry from time to time. In many ways it is similar to painting: imagery develops through experimentation; taking bits out and adding new bits is crucial; form and rhythm create dynamic; the desire to have a final outcome that surprises me is what keeps me going. In other ways, of course, it is very different from painting. For a start, it’s not my profession so I can feel more relaxed about it. It’s also virtually free to do- no studio rent or expensive materials. I tend to write about everyday occurrences and observation and like to find a subtle twist that opens the door to thoughts and feelings. 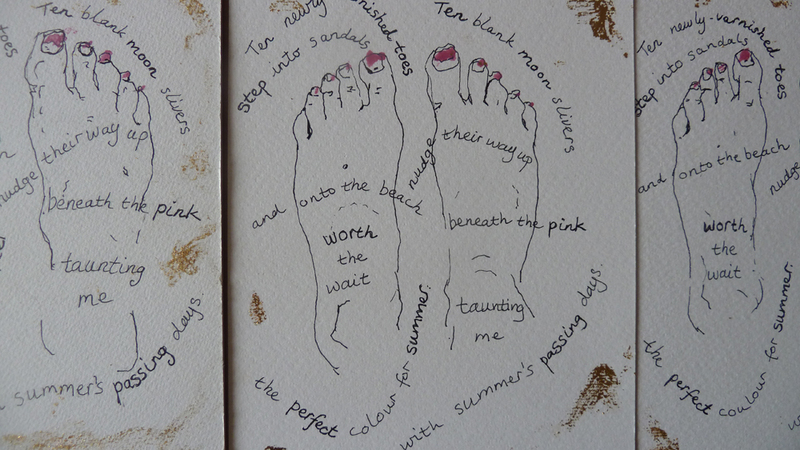 In this poem, Worth the Wait, I have used the imagery of nail varnish as my starting point. 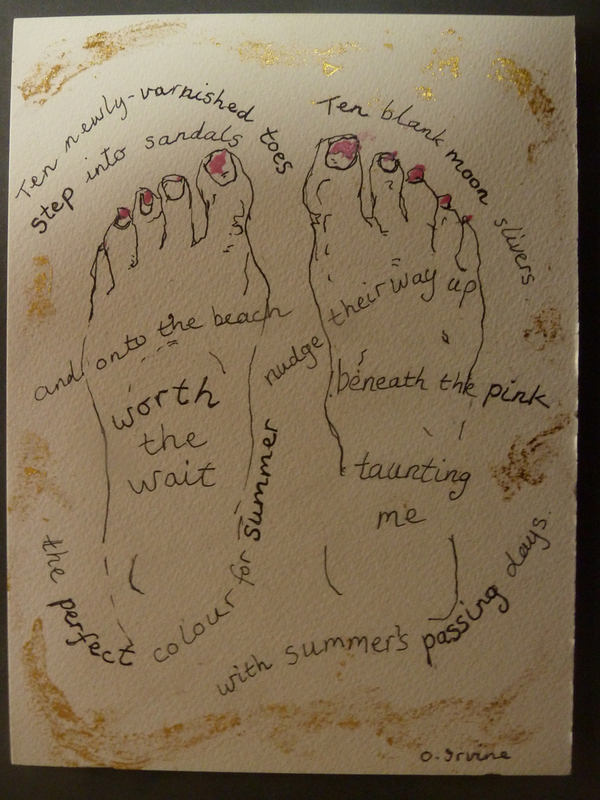 I had not renewed my summer nail varnish once I was back from holiday- no point, as my feet would be cooped up in shoes. As the new nail grew in, a blank shape seemed to push the pink polish up, rather more hastily than I had anticipated. Or had the time since summer really passed that quickly, leaving all my holiday memories behind? 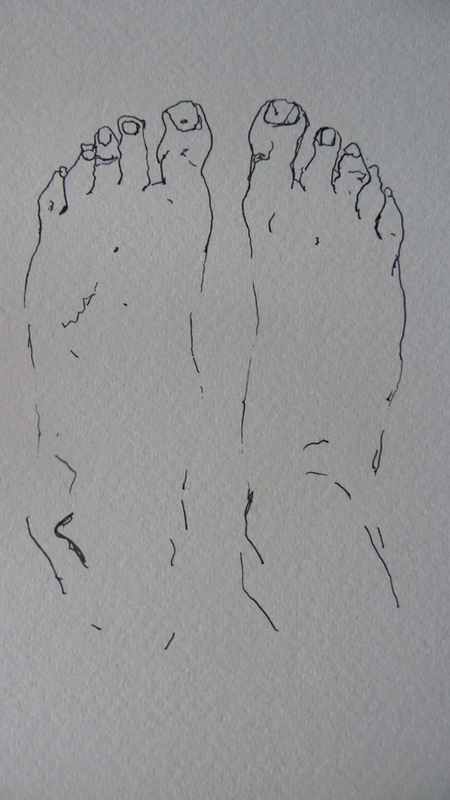 I started off by drawing my feet, with all their imperfections, in ink onto watercolour paper. I did not sketch first, so any slight errors in judgement became part of the drawing. 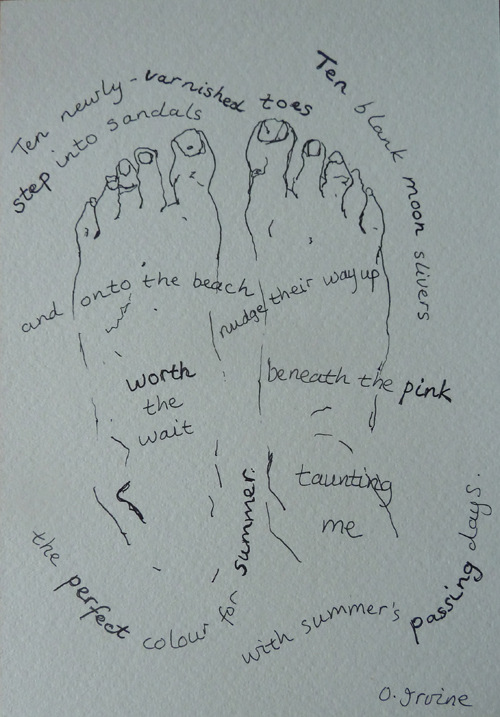 I then wrote the poem on freehand, creating a rhythm suggestive of waves on sand, but not too obvious. I painted my pink nail varnish onto the tops of the toenails. My varnish had a fairly ordinary name, but I wanted the one in the poem to have a more meaningful one. I researched names of nail varnishes- there are some very odd ones and it made me wonder what kind of people get the job of naming them. Worth the Wait had the right ring to it, as it spoke of time passing before, as well as after, the summer holiday. I felt it added a poignant edge to the poem. I finished the illustrated poem off with touches of real gold leaf to give it a certain air of reverence.